The first image of the new Ultimate Spider-Man has been released and I am a very happy fellow. After killing of Peter Parker a few months back in June, teenager Miles Morales is taking over the Spidey suit. And here is the kicker: He is half black, half latino!!! Good for Marvel... I am glad to see them willing to take some chances with a multicultural superhero in such a visible title. Since the Ultimate universe is about doing things you CAN'T DO in regular continuity, why not get someone other then a white guy in there? I will be checking this one out for sure. Thanks to my boy Cal from The Cave of Cool for this tip. That is.. I'm speechless. A whole different spin. Nice! I like the risk that Marvel is taking... today's world isn't just one race but mixed with many. I like that they are vamping up the title with today's lifestyle. But I don't know how some fanboys are going to react with the change of an iconic and classic superhero. 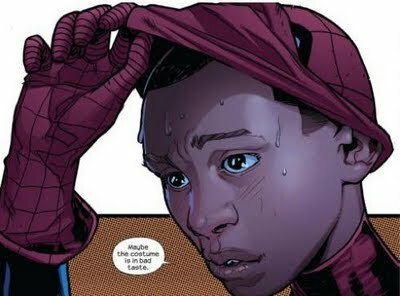 I'm not sure if it's going to be race playing the factor... but more of passing the mantel to someone else... everyone loves & grew up with Peter Parker.